Scientific research on THC (delta-9-tetrahydrocannabinol) began decades ago in Israel, and has since spread to many countries across the globe. Yet its status as an illegal drug has made information about this cannabis compound hard to come by. 1. THC was discovered in 1964. As a postdoctoral student in the early 60s, Dr. Mechoulam noticed that the active compounds in morphine and cocaine had been isolated, but no one had isolated the active ingredient in marijuana. Dr. Mechoulam was in such a rush to conduct his research that he actually broke the law by obtaining marijuana from his friends in the police department. But the scientist still managed to isolate THC in 1964, marking the start of a long career dedicated to cannabis research. The discovery of THC paved the way for later discoveries and earned Dr. Mechoulam numerous honors, including a NIDA Discovery Award in 2011. Despite being the most recognized ingredient in marijuana, THC is just one of many compounds in the plant with known medical uses. 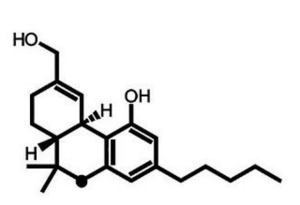 THC belongs to a unique class of compounds called cannabinoids. Since Dr. Mechoulam’s discovery, more than 60 other cannabinoids in cannabis have been identified. THC and CBD are the two cannabinoids usually found in the highest concentrations. 3. THC is used in FDA-approved pharmaceuticals. The first THC-based pharmaceutical, a pill sold as Marinol (scientific name: dronabinol), wasdeveloped by a company called Unimed Pharmaceuticals with funding from the National Cancer Institute. In 1985, Marinol received FDA approval as a treatment for chemotherapy-related nausea and vomiting. 4. THC can protect brain cells and stimulate their growth. 5. Chemicals like THC are found in the body.